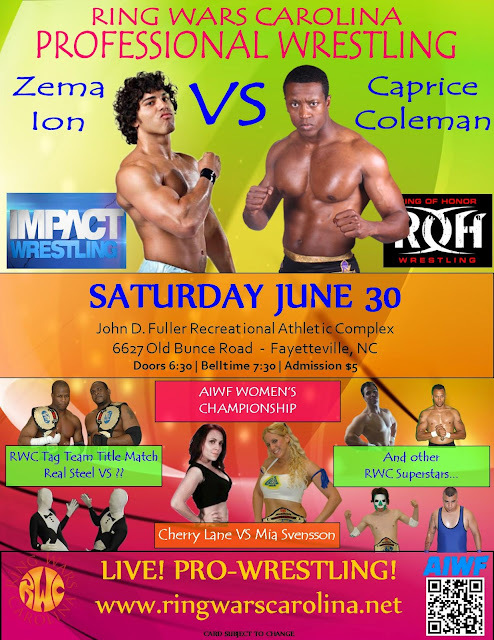 are coming to Fayetteville, NC on Saturday, June 30th to battle it out in the Main Event! The 1st ever AIWF Womens Title defense takes place this Saturday in Fayetteville, NC. The Champion, Mia Svensson just won the title at Heatwave 2012 and she is looking to walk away with it this Saturday after she takes on The Headhunter, Cherry Lane. Both fabulous ladies will be battling it out for the AIWF Women's Championship. And no - that isn't all! The RWC No Limitz Champion, Kris Nemesis will be defending his Title. The return of Diego Vasquez and Fayetteville's very own bad boy and High Flyer extraordinaire, HANGTYME! RWC Tag Team Champs, Real Steel, will be defending the Tag Titles Saturday night against the debuting team of ???? No one knows who they are! This team has wrestled in the Orient and Canada, causing a big ruckus everywhere they go! The people love them and so will the fans at RWC. Getting a title match on the debut? Real Steel must be looking to stop the train this Saturday night in Fayetteville. This Saturday night in Fayetteville, NC you have the once in a lifetime chance to see an Impact Wrestling Superstar take on a Ring Of Honor Superstar. We're talking Young Lions Zema Ion vs. Caprice Coleman. No funny business here, no tricks and no gimmicks! TWO of the hottest up and comers from the Big companies putting it all on the line for Bragging Rights! Come see who prevails, TNA or ROH! You cant afford to miss this action and for ONLY $5 dollars! Who is gonna give you this much entertainment in one night for ONLY $5 dollars? AIWF, RWC and the fine folks at John D. Fuller Recreation/Athletic center! See you there!